The clock has already started ticking for Sri Lanka Muslim Congrass. The lava has bursted from the already burning mountain. SLMC is breaking apart. Two significant persons have already waged a war against SLMC leader Rauff Hakeem. Basheer Cegu Dawood, then chairman of the party has appeared in an interview on Vasantham TV and told that the party leader is caught between too many scandals and not capable of being leader to the party of which constitution is based on Quran and Hadith.Former chairman claimed that the leader of SLMC has lost the credibility to lead the Muslim community. Following his interview in Vasantham TV and his Facebook posts criticizing the SLMC leadership, Basheer Cegu Dawood has been interdicted by the Party high command. Supporters of Cegu Dawood and Hakeem already started a social media war. Another person who has started objecting to the leadership of SLMC is the former Secretary General of the Party Mr. Hassan Ali. Hassan Ali is one of the founder members of SLMC and a admirer of late Mr. Ashroff. Hassan Ali claims that Rauf Hakeem is a bootlicker of Mahinda Rajapaksa and always wanted to be with MR’s side even though the mood of the people was against Mahida. During a public meeting held in Nintavur on 2017.03.03, Hassan Ali claimed that Mr.Rauf Hakeem wanted to support Mahinda Rajapaksa during the last presidential campaign. Hassan Ali was the main reason the party has joined the Mythri Faction he claimed. Since then Hassan Ali was seen by Hakeem as his rival to his leadership. The origin of the rift between Hassan Ali and Hakeem goes back to 2015 delegates’ conference. During a mandatory high command meeting prior to delegates’ conference, Mr. Hakeem has introduced a new position -‘secretary to the command’ apart from the already existing Secretary General to the party which was occupied by Hassan Ali. This move is to silence Mr. Hassan Ali who had become a headache to Mr.Hakeem. Mr. Hassan Ali has objected to this sudden Constitutional change and made a complaint to the Elections Commissioner. Elections commissioner instructed Mr.Hakeem to sort out this issue, if not he said that the party will not be able to contest under the party symbol. Having smelled the seriousness of the issue Mr.Hakeem has promised Mr. Hassan Ali that his Secretary General position will be restored in 2016 delegates conference and he will be given MP seat in the Parliament. Mr.Hakeem has promised Mr. Hassan Ali that the current parliamentarian MHM.Salman would resign his position and leave room for Hassan Ali to take oath as a parliament member on 2017.01.09 when the parliament reconvened. Mr.Hakkeem handed over to Hassan Ali a copy of the resignation of Mr. Salman from the parliamentary membership. Having believed what the leader has promised, Hassan Ali agreed to go silent on the Secretary General issue believing that his original position would be restored in the next Delegates’ conference that held last month. But the letter of resignation was not handed over to the Secretary General of the parliament. Salman remains the MP. Attached is the copy of the resignation of Salman, Hakeem has given to Hassan Ali. To his disappointment, Hassan Ali kept silent waiting for the delegates’ conference where he believed his Secretary General Position would be restored. That also didn’t happen. Hassan Ali decided to go public. 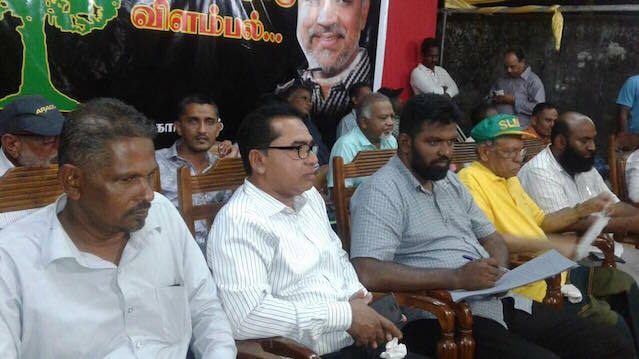 Yesterday a meeting was arranged in his town Nintavur where Hassan Ali explained to the public how he, being a founder member of the party was cheated by the Leader and ousted from the position that he had been occupying for 35years. He spoke sensibly to a huge crowd that appealed to their senses. Hassan Ali is one of the founding pillars of SLMC. He is the founder General Secretary to the party. He is revered among the SLMC supporters as the most senior party member after the demise of Mr. Ashraf. Hakeem’s dissidents within the party have also joined hands with Hassan Ali during yesterday’s meeting. This is expected to be a big blow to the SLMC’s leader Rauf Hakeem. The pulse of the Ampara district is that the supporters of SLMC have started to think that Hakeem is ruining the party leadership so he should be removed. The supporters also think that Hakeem Being born and bred in central province cannot understand the political needs of the Eastern province Muslims. People think that Hakeem is not capable enough to voice the political aspirations of the Eastern Muslims. They also think that Hakeem is not suitable to lead a party that has its roots in East. If this situation persists like this there is a serious possibility SLMC will split. Already negotiations have started to form an alliance among the SLMC dissidents to fight against the big enemy some reliable sources say. This mood will lead to a juncture where people will be left a choice to choose the party deposing the leader or keep the leader deposing the party. Eastern Muslims will always choose the party. Upcoming provincial council elections will prove that. There is nothing new in this post. More than an opinion, it sounds like a warning letter to SLMC leadership. Cutting a poisonous fruit into two, won’t make one-half an antidote to other-half. Same guys, same power hunger…with an extra element dividing the ordinary people. The reason why there are so many MUSLIM political parties is that they receive millions of dollars from Arab countries. They fight because they can’t share the money equally. SLMC was formed to create a Caliphate in the Ester province. For that Asrof was bulldozing the Buddhist archeological sites, and another corrupt Muslim politician is destroying the Wilpaththuwa jungle for a Caliphate. If Muslims have any problems, without being shy, just call the BBS, they are just a phone call away, they can solve all your problems. Caliphate in Kathankudi is for Saudi Arabian Wahabis. Caliphate in Wilpattu is for the other group. govt is letting both groups to wreck the country. SLMC did not fully represent all the Muslims, only the Eastern Muslims, to protect then from the LTTE atrocities and hegemony, and prevent being marginalized by the Sinhala Politicians. From that viewpoint, they partially succeeded. However, they also caused the non-Eastern Muslims to be alienated from the majority Sinhala in that they drifted away from the National parties UNP and SLFP, despite the marginalization. They also took on a religious affinity, pampering the Ulama, Mullahs and Imams, in order to get their political support, of the general Muslim Population. Instead of doing what is right for the Muslim community, they took on the aspirations of the Ulama, mostly funded by the Devil, Satan, Iblis following Wahhabi Saudi Arabia, who have the lowest critical thinking skills in the world. The best example is the Muslim Marriage and Divorce Act (MMDA), where the SLMC is silent. Then Sri Lankan Muslim girls and women are not given the rights enjoyed by Muslims in Bangla Desh , Turkey and elsewhere, because the Ulama interpret the Sharia to their own advantage and Hegemony, and the SLMC goes along with it. These denied rights are against the Sri Lankan constitution and rights , and SLMC is silent. Why? They are licking the asses of Ulama, Mullah and Imams, so that they will not go against them. An intense greed for power is the foremost attribute of any politician. Power enables the realization of his / her more mundane desires for wealth, influence and popular support. The politicians representing various Muslim political parties are no different. Unfortunately for the Muslim Community, they decided to achieve and retain their greed for power by projecting themselves successfully as having the interest of the community at heart at a time when the Community was beginning to feel alienated from the mainstream political process following the new Constitution of 1978. The SLMC was never a ‘national’ political party for Muslims. It was, is and will wither away as a provincial party. It drew it’s initial support from members of the Community aroused by a sense of religious euphoric hysteria, which was badly shaken when credible stories began to emerge regarding the greed of various members of the SLMC. Was the behaviour of such ‘leaders’ compatible with the teachings of Islam ? In 2014, at the height of the anti-Muslim agitations, all the Muslim Parties that contested the WP PC elections, collectively accounted for only an estimated 17% of Muslim votes, while in the subsequent Uva PC elections they manged to garner just a meagre 12% of the Muslim votes. The writing was clearly on the wall. The Muslims were either voting for one of the National political parties (UNP, SLFP or JVP) or were abstaining from casting their votes. In their desperation, these Muslim Political parties are now demanding that 10% of the electoral seats be allocated to the Muslim Community. Has it not sunk in to their brains that the average Muslim voter does not vote for a candidate just because he is a Muslim ? In their desperation, these Muslim Political parties are now demanding that 10% of the electoral seats be allocated to the Muslim Community. Believe me. BBS is just giving the alram only. Muslims become a head to Sri lanka. Just see the growth. they say it is because Islam is good. “Stones and sticks are thrown only at fruit-bearing trees.” More you bad mouth Islam and Muslims, stronger they get day after day. Do you really think that BBS is going to achieve something that Donald Trump has just tried and stuck, lost, & struggling now, not knowing what to do next? Believe me. BBS is just giving the alram only. Muslims become a head ache to Sri lanka. Just see the growth. they say it is because Islam is good. Above is what I said. If BBS is nothing why you people are complaining a lot. Because your fradulent appraoch is exposed. BBS is nothing. they are just ringing the alarm bell the disaster muslims are creating. but, rome was not built in one day. Do you know the story of David and Goliath ? An exaggerated fear, hatred, and hostility toward Muslims that is perpetuated by negative stereotypes resulting in bias, discrimination, and the marginalization and exclusion of Muslims from social, political, and civic life, is not just alarming. Decent, cultured, educated and nation & peace-loving Sinhalese are also against or stayed away. On the other hand, BBS also brought up and highlighted or alarmed about many other sensible issues that nobody cared or gave attention. Narrow-minded racists like you encourage BBS to be only a racist organization but nothing, to hide behind and show your hatreds. Your reference to David and Goliath is a good reason that suggests you’re suffering from an illogical and inexplicable fear. Read the following; This is waht BBS is saying. Muslims want to continue the expansion, so they don’t like BBS. It is in this background and context we have to understand how far the Muslims have come since 1976. Population has increased from around 5% to now near 10%! They have been on a rush to multiply with polygamy, indiscriminate and runaway breeding. This increase is facilitated by funding for such practices from the Middle East. Increase in numbers has also brought about a new militancy in challenging the indigenous Buddhist Culture, Buddhism and the Sinhalese. As for the purchase of land they have over achieved what Col Gadhafi wanted them to realize. One only has to go along the major road arteries that emanate from Colombo or other major cities to understand this creepy crawly encroachment – on either side of these roads to find out who owns these trading establishments. Over and above these one has to look at what is happening to the suburbs of Colombo – all prime land is being bought over by Muslims to make a clean sweep of Colombo and her environs. Then it goes to other areas down the southern coast line – Wadduwa, Kaluthara Beruwala Aluthgama. Even 30 years ago in some areas it was only the village temple that was left after Muslim encroachment. Today I believe after the demise of the temple priest the temple land too is in their hands. Mosques are mushrooming all over the island, apparently there is a mosque for every 50 Muslim families in the island. In total they now outnumber all the Buddhist Temples and Hindu Kovils. Nation and peace loving Muslims and non-Muslims with the dream of putting SL in par with better countries don’t take radical and extremist movements, that threatens a nation’s development as serious elements, be it Islamic or Buddhist or Tamil. This should have been very clear with BBS supported BJP not being able to secure a single seat in 2015 general elections. This is also a clear message saying what people of SL really want at this time. And in April 2015, Mahinda Rajapake himself called them “Western conspiracy”. So, it is your choice if you take them serious. Every community in SL has their own issues, but you can’t resolve your community’s issues by creating an issue within another community, thus you can’t curse neighbour’s son who is doing good at exams for failures of your own son. Jim softy, If you’re a backward hatred filled sort of a personality who is living in the past and don’t like living in harmony, it is also your choice and nature, but please don’t spill venom. Then All those sears will be controlled by the Ignorant Ulama, Mullahs and Imams. The Muslim girls and women will then never see freedom and liberation. That will be great tragedy for Sri Lanka. If freedom and liberation means parading semi naked, then yes Muslims will never want it. Then what is fashion bug, fashin house like places run by muslims are for ? So called leader of SLMC himself is not practicing as muslim.. then how can he still lead SLMC and community of Muslims in Sri Lanka. The essayist is obviously anti Hakeem. The SLMC unlike the other political parties in the country was formed by Lumpen Muslim elements. A.H.M.Ashraff ,its leader was the son of a Grama Seveka Niladhari. informing Hakeem who was the Party Leader. 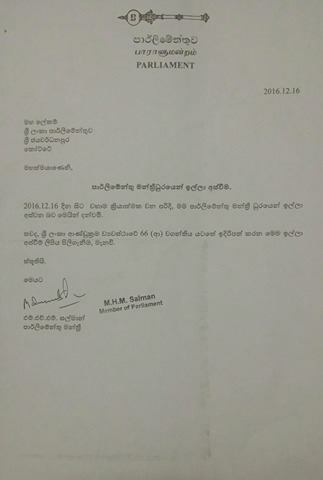 Several rank and file members of the SLMC say that this one time EROS MP is now the owner of several petrol sheds! The tussle in the SLMC is between the Muslims who live among the Sinhalese and the Muslims in the East! Basheer Ceygu Dawood was recently disowned by the son of Ashroff as an interloper! Hakeems leadership will continue,if challenged by Basheer! A glaring defect in democracy is the dictatorship of the leadership. The leader almost always increase their wealth and allow the inner circle to indulge in this principal activity. What is happening in SLMC is exactly that. Has any SLMC leader talked about MMDA? No Pillai. What is happening in the SLMC is to grab the party power to East. Do not forget that Hassan Ali and Basheer are easterners. The intruder is the silent operator Nazeer Ahmaed the Chief Minister of the East, from Eravur. He plays the game of Savior from Tamil power against Muslims and using eastern business people who are better known to him than to Hakeem, to oust any contender against him by using Rauf Hakeem! One day Rauf Hakeem will regret allowing Nazeer Ahmad to have his sway. But we understand that since Nazeer is the “collector” for Hakeem he cannot drop him. Everyone knows how Nazeer became rich just after the death of Ashraff for whom Nazeer was the “collector”. Hasten the day when the Muslims will polarise towards the main political parties rather than band themselves as a community handing on to the sari potha of whatever party will throw trhem a crumb or two. It is a wrong article to mislead the people. What is wrong on this article , could u explain to us? Every dam political party in SL is based on one personality or other.What more even after the Leader dies people keep harping about him or her.This is what differentiates political parties in the East and those in the West.Take the political parties in the U.K., no one cares to know who their founders were.Only party policies were important and they too evolved over time.In the East the founder is celebrated each year with hosannas. In the case of the SLMC the writing has been on the wall since Ashroff departed.The 2015 election results showed that the Muslims are just tired of the SLMC under the incompetent Hakeem and other party brigands mentioned in this well written article.Even Kumari Cooray’s ghost outside Quddus’ Carnival Ice Cream shop in Kollupitiya can help Hakeem or the miserable SLMC now.